Happy Friday, friends! 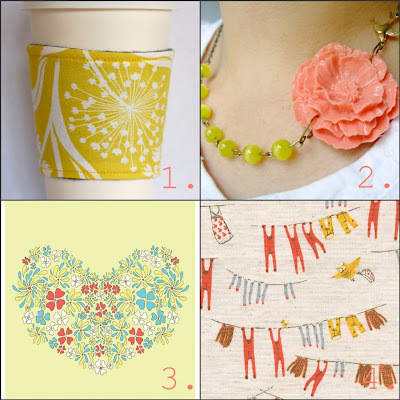 I've been loving the combination of yellow & coral lately. It's such a fresh color combo & I keep finding myself finding a way to wear both. Here are some yellow + coral finds that I thought I'd share! 2. Summer Sweet Poppy Necklace by RachelleD on etsy. 3. My Heart Blooms For You print by O'Reilly Ink on etsy. 4. This "clothesline" fabric by Heather Ross. I just love it! I found it over at one of my favorite online fabric shops, bloomerie. Do you have something yellow + coral in your handmade shop? I'd love to see it! Leave a link to it in the comments section! I keep wanting to get a pair of Toms - I have found one store that sell them here - I'm just trying to justify a new pair of shoes lol. 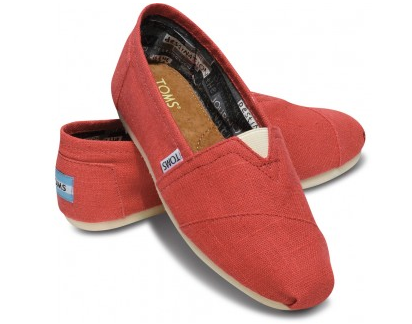 I want a pair of Toms SO BAD! Those toms are really cute! I like the color a lot. Here is my coral and yellow item! those TOMS are the perfect color!! i want!